As I mentioned last time, my husband asked what I wanted for Christmas and he delivered. My collection has expanded again to include the most wonderful Kitty Cheshire! I'm usually not into collecting spin-off lines when I start collecting a certain kind of dolls. I love to get the first wave but don't bother when they start adding more and more. 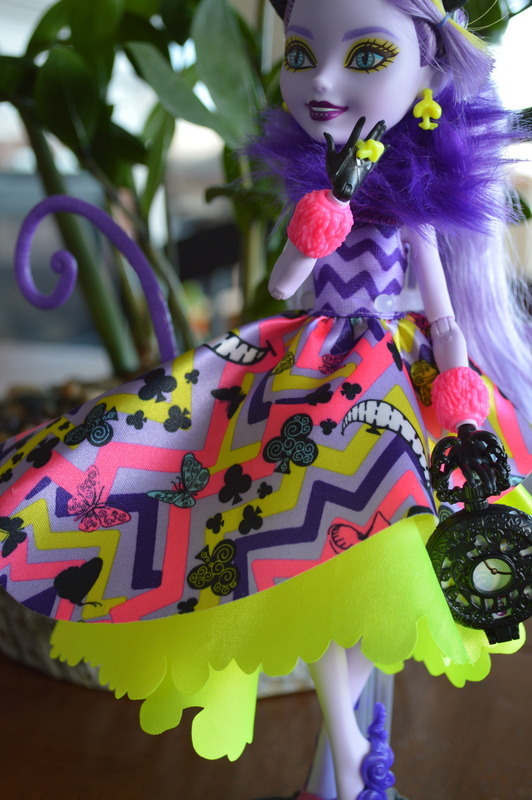 However Ever After High has had some pretty cool lines through the years and I fell for the Thronecoming line and it was THIS doll that turned me on to the Way Too Wonderland line. I just couldn't get enough. 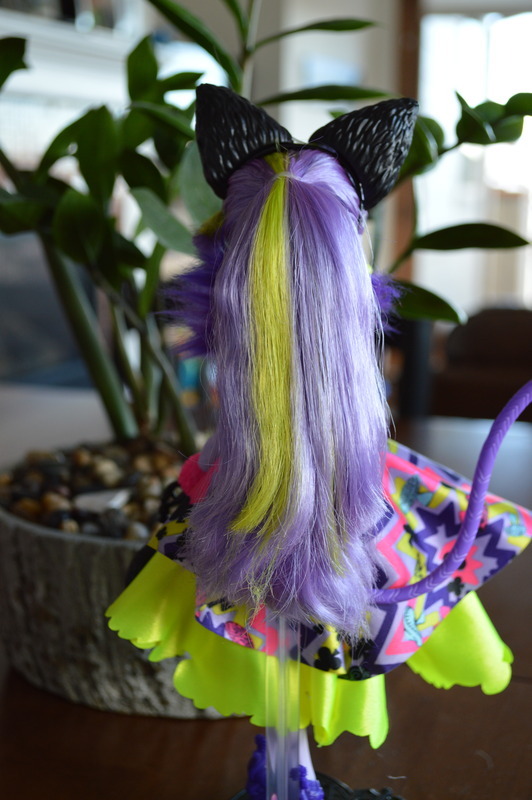 The purple, the neon yellow, the tail, it was just too much and I was hooked. Kitty is (I think) one of the most coveted characters and it's easy to see why. Her cat-eyes and the ears are fantastic! Her original doll didn't come with cat ears and I love this addition. (Yeah, they're a little big but it's Wonderland!) And the fur! 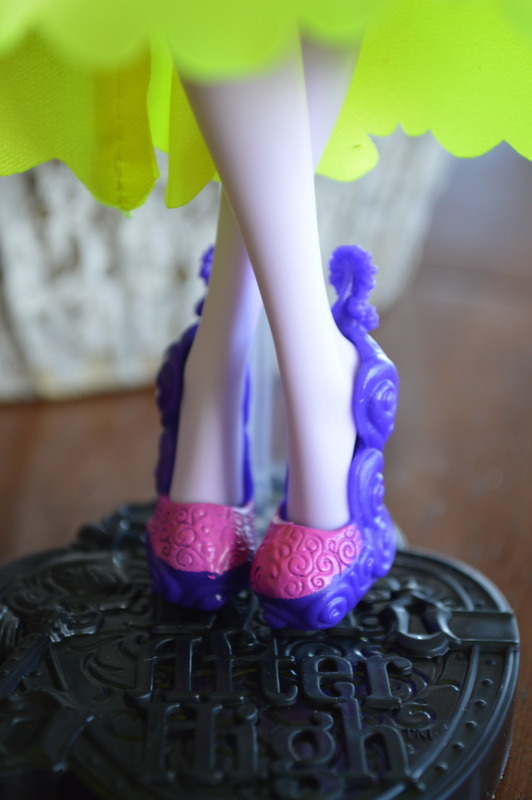 The purple fur collar just makes the outfit however it was a little crumpled coming out of the box. Still trying to make the right side lay down like the left. And her earrings and ring are little mushrooms! She has an asymmetrical hemline dress with a zig-zag pattern with clubs and butterflies. I love the scalloped hem on the bottom layer. Her dress is the same material as Maddie's overcoat so it's going to take a while to get it to lay down straight. Her shoes have a swirl theme which is super cool. 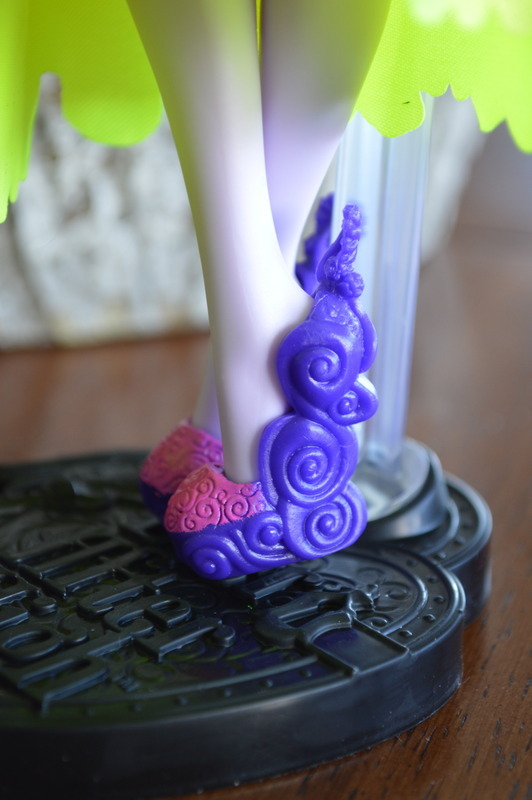 At the top of the heel, it's a daisy flower. We are looking at the side but it is visible from the back. And the toes are pink with a swirl pattern as well. Kitty's hair came out of the box super straight and shiny. I love the yellow streak. And the tail! Kitty is definitely my favorite of this entire line (Briar is a very, very close second.) What do you think of this Kitty doll? Do you have her? Let me know in the comments! I'm getting the itch to craft. Not sure why! So after the craziness of our vacation and my son's birthday, I'm going to get started on that and I'll post my progress here! I would like to personally congratulate you as your blog The Barbie has been selected by our panelist as one of the Top 100 Toy Blogs on the web. I personally give you a high-five and want to thank you for your contribution to this world. This is the most comprehensive list of Top 100 Toy Blogs on the internet and I’m honored to have you as part of this!